Miranda Cosgrove wears the Wildfox ‘Tour Eiffel’ Rose Print Graphic Tee and Current/Elliott ‘The Snap’ Stretch Denim Jacket with fans! [edit Feb 21 2013] available on eBay! 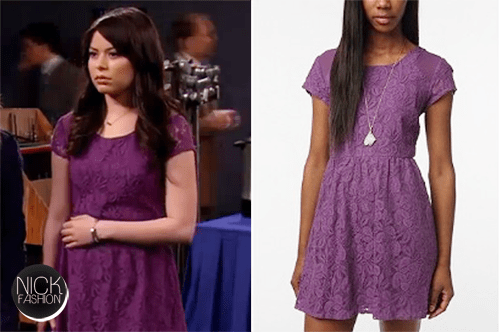 Miranda Cosgrove’s character Carly was wearing the Urban Outfitters Purple Coincidence & Chance Revel Dress in the episode iLove Jimmy Fallon (renamed iShock America), a joint episode featuring iCarly, Jimmy Fallon, The Roots, and Tina Fey. Miranda Cosgrove’s character Carly wears the Urban Outfitters BDG Blue Striped Cardigan in the episode iChristmas. I bought this on eBay like a year ago or so but I can’t find a picture of it. Miranda Cosgrove’s character Carly was spotted wearing the Urban Outfitters Pins and Needles Trellis Dress in the iCarly episode, iFind Spencer Friends. Found this a while ago but forgot to post it! This episode featured Emma Stone. Dress is sold out at Urban Outfitters but pops up on eBay once in a while. Miranda Cosgrove’s character Carly wears a floral H&M dress in the iCarly episode, iOpen A Restaurant. I found this dress a few months ago but I was too lazy to upload a picture of it! I think I got it on sale at H&M for about $10 in October or so. It’s available in a size 4 here! Runs pretty true to size. I’m 5’3″ and it goes to right above my knees, whereas Miranda is 5’6″ 1/2 and it goes to about midthigh on her! Maybe it was shortened, too. Miranda Cosgrove wears the Scanty Roper Blue Cowboy Classic Long Sleeve Tunic Nightdress in the iCarly movie, iGo To Japan! It is available on eBay here. Let me tell you, I own this, and it’s super comfy! Just kinda tight, and rather expensive! Miranda Cosgrove wears the Ella Moss Apollo Pink Orange Tank Top in an unknown iCarly episode.